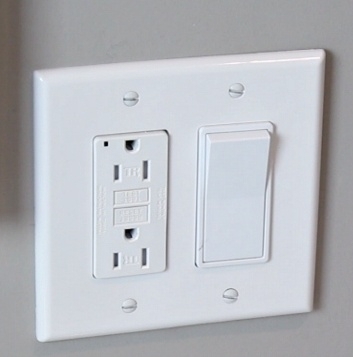 GFCI Outlets Are the In Thing to Own! One of the most significant electrical safety projects you can do for your home is adding GFCI’s. GFCI’s offer safe electrical power in areas where water is found or might be under certain conditions. The reason we add GFCI’s to areas where water might be present is that when electrical circuits might come in contact with water through a person. Lots of people don’t realize the danger of mixing moisture and electricity in the innocuous setting of their kitchen or bathroom because standing on a wet floor or mat after a shower happens quite frequently, so it might not be obvious not to use an electric curling iron if the floor is still wet. Oddly enough, it only takes a tiny amount of electrical current from one of these situations to cause fibrillation. By contrast, electrocution is a form of being burned. Burns from electrocution might or might not kill a person, but they can be horrible, and it could be a long, slow recovery. Electrical code requires GFCI’s to be in kitchens, bathrooms, laundry rooms, garages, and outdoors since these are all areas where water is likely to be present. If your home is over 20 years old, it may not have GFCI’s. Adding them to appropriate areas would be a significant safety upgrade. The numbers of people requiring medical treatment for shock and electrical burns has been reduced substantially since the advent of the GFCI. If you have a GFCI and the reset button pops on it, there has been an electrical event. Reset the GFCI as soon as possible. During periodic testing maintenance, reset the GFCI after the button pops. Replacement is the only option if it can't be reset. Their inherent design makes GFCI's somewhat sensitive, so it will have to be replaced if the device needs to be frequently reset. A GFCI should be tested monthly to make sure it’s in good working order. If you need electrical repairs or help, give us a call!